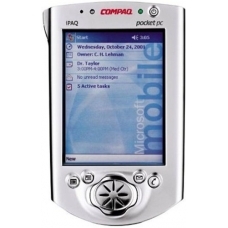 The Compaq iPAQ h3630 Pocket PCs are designed to go everywhere with you Compaq's iPAQ pocket PC combines a real Intel processor, new hardware, and a sleek industrial design that fits in your hand to create a powerful and stylish PDA you can take anywhere. It offers 32 MB of RAM and 16 MB of ROM enough memory to hold a robust package of applications while leaving you a lot of room for your own applications. The color TFT screen produces 4,086 colors, and you can view the screen from many angles and in a variety of lighting situations. The Compaq iPAQ wraps the power of a Microsoft Windows operating system in a new interface designed for ease of use in a portable format. * The iPAQ allows you to input data in your own handwriting, by soft keyboard, by voice recorder, or through inking. * The Compaq iPAQ h3630 is sporty and small at 5.11 by 3.28 by 0.62 inches and 6 ounces, it fits in your hand or slides into your pocket with ease. * Compaq has also built in utilities so that frequent actions--such as switching between tasks, adjusting volume, or changing back lighting are only a click away. * You receive a great deal of Microsoft software, such as Pocket versions of Word, Excel, Internet Explorer, and Outlook. - Power: Built In Rechargeable 2200 mAh Lithium-lon battery.